ooooh and the colour of this cafe... I don't think orange can be any louder... and I ADORE it! Yesssss... this film was filled with inspiration for moi... sooooooo... I painted Les Parapulies de Cherbourg (painting is available email me for information... would make adorable notecards too!)... ENJOY your day... and if it is raining outside... don't forget your umbrella! Thanks soooo much for your comment darling, don't miss the second part of my weekend on my blog. Well, now I have to go add that to my Netflix! It looks like a wonderful movie to get inspiration from. Your painting is wonderful!! rained here today and with my umbrella in hand I ventured out into the gross weather! 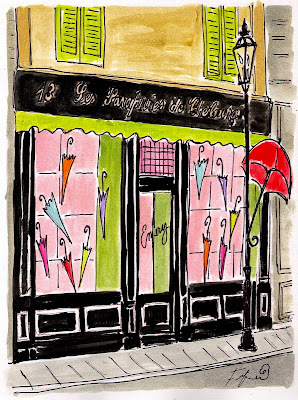 Love the painting of the umbrella store. 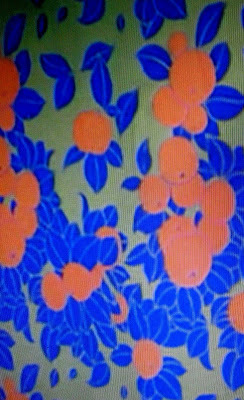 I love the "Matisse" wallpaper. By the way your French word of the day is great!! LOVE it! 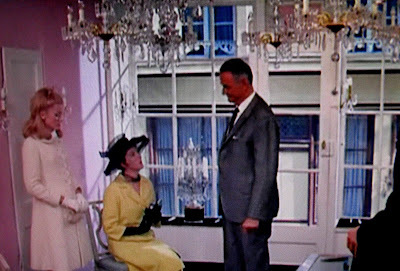 I get so inspired by the set design in cinema--especially the classics! 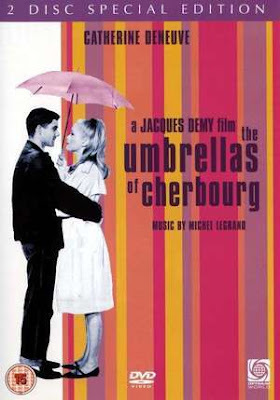 As much as I would like to take credit for this wonderful film series, it was actually presented on lovely Stephanie's blog at Bonjour Madame! Stephanie is so full of fabulous and interesting posts that I wish I had thought of but alas I cannot. Honest mistake, it happens to the best of us - I'm usually the queen of them. Just thought I'd clarify so everyone can check out Bonjour Madame! Have a great week Fifi! i've never seen that movie, but have always heard such good things about it. i love your interpretation! I love foreign films ...it is like taking a virtual vacation! Also adding this to my Net Flix list...thanks Fifi! I'm so glad you got to see the film! The colors are amazing and note how the wardrobe matches the decor. It's a technicolor like dream! Thanks for the mention! Never have seen this movie. Love the colors and set design. I love the painting too. Umbrellas are such fun to paint and use as props. 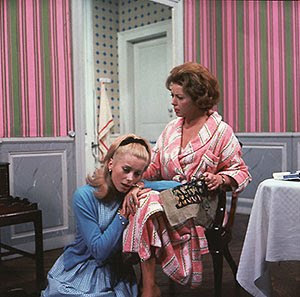 These film stills positively scream Fifi Flowers! I love it. I've actually never heard of this film but will have to add it to my queue as well. Have a great one! Suddenly I'm in the mood to watch this movie. I can't believe I've never seen it. It looks fab. And your painting is divine! How beautiful! I'll be adding that film to my Netflix queue! 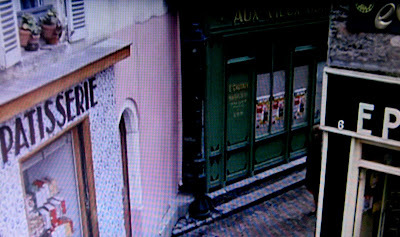 Number one I adore Catherine Deneuve. I think she is the most beautiful woman in the world. That Movie is so old but I remember liking it alot. Wallpaper is my sickness. This house only has 2 rooms done. I spent most my life stripping and hanging paper Love it. I think I need to watch this film! the wallpaper is awesome!! Oh,parfait! It is raining here also, and we just got Netflix yesterday, love it already, so I think I shall follow your lead! In answer to your question, I would certainly hope that Mlle. Chanel would NOT do Target...food for thought! That movie even reminds me of you! It looks great. Oh Fifi! I do so love your colorful artwork -- I love my notecards so much, I just can't bear to write on them, Anyway, thanks for your visit today -- I do hope you'll be able to find one of Michael Lee West's books -- You'll love them! I love a room with pink walls and gorgeous lighting...I am trying very hard to keep the walls in my studio white but in my heart I feel they should be pink!! love all the images above. I've never seen this film but the stills you choose are just lovely. And your painting is perfectly Parisian! Love it! it was a film to die for! ah well, we have the next best thing...being tres chic fab femmes!